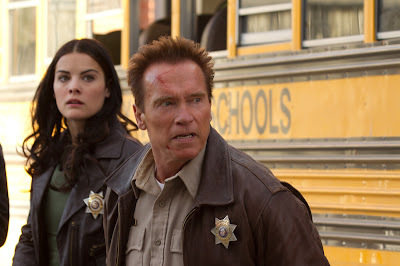 The Last Stand marks the return of Arnold Schwarzenegger to leading man status in an action film. More tantalisingly, it marks the Hollywood debut of South Korean director Kim Jee-woon who previously made the ultra-stylish I Saw The Devil and The Good, The Bad, The Weird. So new blood meets the man responsible for most of the blood in cinema for two decades. Ray Owens (Schwarzenegger) is the sheriff of a sleepy town in Arizona about to receive a visit from an escaped Mexican drug lord (Eduardo Noriega) making a break for the border. With the only back-up left in town being the good (Jaimie Alexander, Zach Gilford), the bad (Rodrigo Santoro) and the weird (Johnny Knoxville, Luis Guzman), the past-his-prime Owens must form a line of defence which FBI honcho, Agent John Bannister (Forest Whitaker), thinks is beyond him. It is good to see Arnie back in this territory. It is arguably the only genre which has ever truly befitted him. It has been decked out with his trademark one-liners and there is not a trace of light and shade to his down-the-line lawman. The firepower, courtesy of Knoxville’s comedy gun nut, is fetishised as if the last decade of action cinema never happened. It has the feel of an age old tale of the frontier, tailored as a throwback to 1980s excess. This is the occasional spark to the action scenes and the parts which don’t involve Arnold himself, such as nifty scenes involving a stolen supercar, are generally more successful. Although, when it comes down to a mano-a-mano fistfight it is a joy to see that the big man still has it in spades. While the odd bit of awkward lip service is paid to his advancing years, he is still characterised as every bit the Übermensch he always has been. The real letdown is Kim Jee-woon who doesn’t display an ounce of the sophistication in his action scenes that he showed in his homeland. What that is down to is anyone’s guess but on this occasion it seems as if handling such an iconic comeback was too much for him – or out of his control. Schwarzenegger certainly comes off better in his own spotlight than he has done in The Expendables films but there is the undeniable feeling that his brand of bulky, unsubtle action has lost the lustre it once held. Every pretender to his throne has been gradually chipping away at the Austrian Oak for the last decade and it is only a matter of time before the once proud icon is felled to make a comfortable retirement chair. If this does represent the beginning of the last stand for the action career of Arnold Schwarzenegger, then it was silly and superfluous but plenty of fun.